So, as you all know, I do ballet on a weekly basis and I haven't been complaining much, but I realized that my knees get a little weak especially when I need to go on points on one leg. *Yikes* And so, if you have followed my Instagram, you would see my instastories over the weekend about a visit I made to Sunfeet in Petaling Jaya! They've recently opened their rehabilitation center late last year, and I couldn't resist but to check them out to find out about my foot condition. Since I was my first time being there, I would have to say that the rehabilitation center is insanely spacious, and I think it's cute that they've also thought about the little ones by having a kids corner to get comfy for parents who are getting themselves checked. In today's environment, I would have to admit that it gets challenging to think about personal care when we are always so busy with our daily lives, and im here to tell you to take some time to give your body the attention that it needs. Giving your body time is one thing, and getting the quality and care that you need is another. I personally think that our feet play a huge role in ensuring we get things done on a daily basis, and sadly, we usually give less attention to our poor feet. Since my foot condition is getting a little bad, I admit I was a little worried about problems like having a flat foot, cerebral palsy, knee pain, scoliosis and even diabetic foot! Visiting Sunfeet was not a regret as they provide free food scanning to identify your foot problem for you which I got the time to get myself checked as well. I found Sunfeet International Rehab Centre special because its a 3-year generation business which means the family has a bloodline of treating all kinds of problems to satisfy patients throughout generations. The center itself is also fully equipped with an occupational therapy room, a sports rehabilitation, prosthetics, podiatry, orthotics, pedorthics and even physiotherapy. And being given the chance to meet the man behind everything, Dato Dr. Edmund Lee, I believe that his aim is to always provide only the best service to help people solve their orthotics problems. 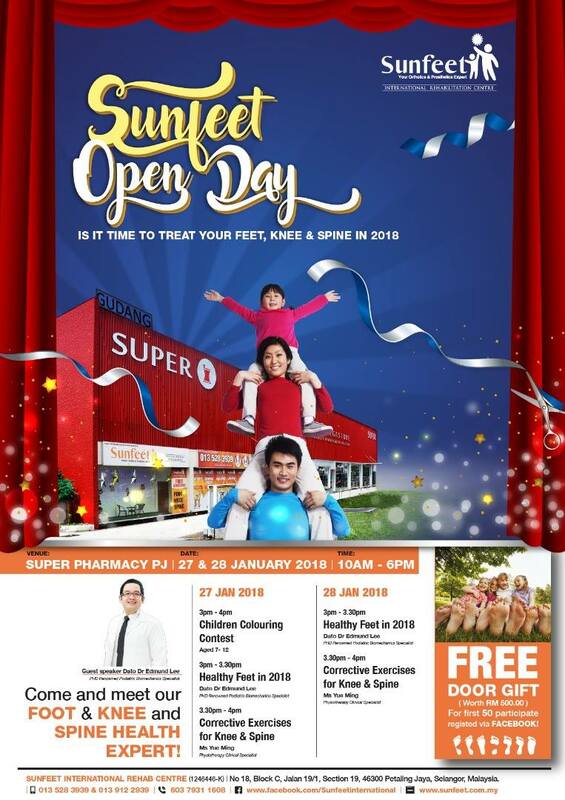 To celebrate its first center in Petaling Jaya, Sunfeet International is inviting the public (yes, that includes you!) for an exciting open day on 27th January from 10am until 7pm with activities including an exclusive public talk by Dato Dr. Edmund Lee! And not to forget the kids, there will be a coloring contest with a special promotion available at 15% off on selected products! Its always better to be early as the first 50 customers will also receive RM500 worth of vouchers from Sunfeet International too! A chance not to be missed! Can you feel the CNY spirit? Since Chinese New Year is just around the corner, Sunfeet International is also offering an exclusive promotion with the Happy and Healthy Feet for Your Loved One's promotion valid until 28th February 2018. This promotion includes a gift box set and its ideal as a giveaway for your loved ones too! Take it as a gift of love to provide your loved ones with health that gives the right support that their body may need to reduce knee, hip or back pain which may be coming from their feet. After all, you'll never know till you get yourself scanned. I have to emphasize that Sunfeet International is a Malaysian homegrown that focuses in providing orthotic services and prescriptions and orthotic & prosthetic products to satisfy the needs of the ever-growing orthotics and prosthetics care in the country with the purest intention to assist those in need of orthotics services. Sunfeet International is open 7 days a week from 10am - 7pm, and if you have any other inquiries, you can contact 013-528 3939.
this is a good place to get our feet checked, and getting it treated. I was there last month or so, highly recommended! i wan to the CNY Gift Set ! I find that many Malaysians have issues with their feet. I think it is a high possibility of wearing cheap shoes from China with no contour. Worth to pay visit to know our feet. Looks like a good place to get my feet checked. I like their CNY promotion. Oh!! I think I need to share this to my friend who needs some advice on his fractured feet because of playing basket ball. Glad you share this! Read so much review about this. Think is time to check out this place.